Request 1 or more size range here. 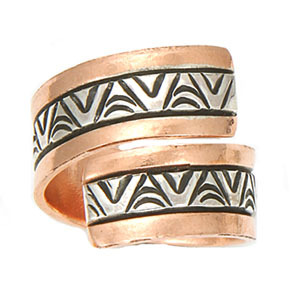 This copper adjustable ladies ring has stamped sterling silver going down the center. It measures approximately 3/8" wide. Made by Navajo artisan Wylie Secatero. Stamping will vary. Sizes 5 thru 9. Choose size range when ordering.